IMPORTANT: If you place an order for this model you MUST mail/email/fax us your Club Order Form which will be included with an upcoming club mailing. 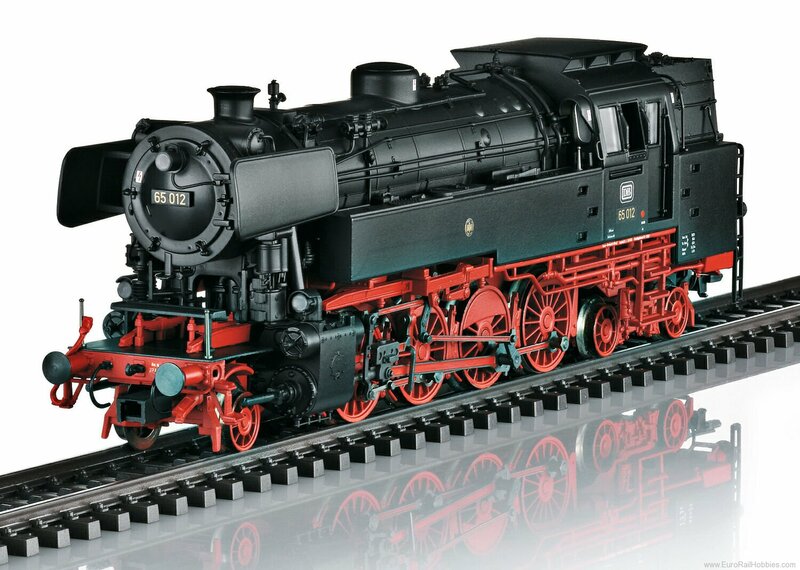 The class 65.0 for the first time as an H0 model in the famous Märklin precision! Cab lighting also controlled digitally. Marker lights controlled separately in digital operation. Multi-protocol decoder includes mfx+ "World of Operation" function and extensive operation and sound functions. The DB''s new construction program provided for a tank locomotive for passenger service in commuter operations. A driving wheel diameter of 1,500 mm / 59 inches and a maximum speed of 85 km/h / 53 mph were specified for this. In addition, a 2-8-4T wheel arrangement was stipulated in order to be able to provide sufficient coal and water supplies. It was supposed to replace the classes 93 (Prussian T 14 and T 14.1) and 78 (Prussian T 18). Preliminary studies for this new class 65 had been done a good ten years before in the DRG period, hence the resulting technical similarity to the DR class 65.10 built later. Krauss-Maffei, Inc. in Munich delivered the first handsome prototypes 65 001 and 002 in March of 1951. Another eleven units (65 003-013) were placed in service over the course of the year. After a thorough probation period, another five units were ordered. They were delivered in 1955 and 1956. In accordance with the DB''s new construction principles, the locomotives were equipped with completely welded high-performance boilers with combustion chambers as well as a welded sheet metal frame. The first 13 units had Knorr feed water heaters; the others had Henschel mixing preheaters as well as small changes in the superstructure and the cabs. Road numbers 65 012-018 were equipped with a control setup for shuttle train operation. The DB divided the first 13 locomotives among the Darmstadt District (65 001-007), the Düsseldorf storage station (65 008-010), and Letmathe (65 011-013). On the contrary, the clone series went completely to Essen. Starting in 1954, road numbers 65 011-013 were added to the roster and turned in excellent results with their siblings primarily in shuttle train service. Due to their enormous starting acceleration, they were ideally suited for this work. They were used intensively and thus racked up considerable kilometers / miles: Road number 65 014 achieved an almost unbelievable 14,821 kilometers / 9,263 miles in 29 working days in January of 1958, with a section of 511 kilometers / 319 miles per working day! The Darmstadt District formed another stronghold, where eleven locomotives were stationed between 1954 and 1966. Yet with structural changes, road number 65 007 was the first to be retired as early as 1966. The last seven units found a new home in 1970 at the mustering out facility in Aschaffenburg, where they made themselves useful chiefly on the line to Miltenberg. By April of 1972, all of the units with the exception of road number 65 018 had to be stored with damages or expired maintenance deadlines. DB Silberlinge - Silver Coins Passenger Car Set (2018 TRIX Profi Club Model) w/Lighting & Figures!